Unlimited access to all classes, courses and other media in our Video Library. Watch at any time as often as you like with this all-access subscription. Includes all video recordings in our video library, all playlists, and video recordings (does not include live webinars). Learn about the design, construction and cultural environment of this semi-passive greenhouse system. 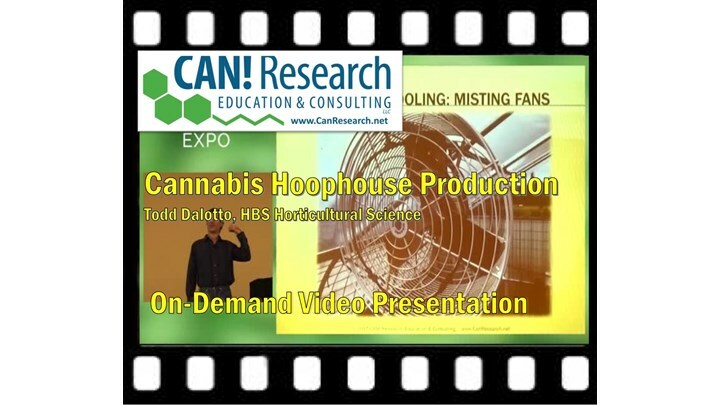 Todd Dalotto's original style of Hoophouse Production minimizes the costs of energy, equipment, real estate, and pest control by utilizing the sun, soil, wind, and natural beneficial microbes & insects while achieving high yields and connoisseur-quality flowers. Learn how HoopHouse systems have the lowest capital expenses, lowest operating costs and least risk of crop loss, with excellent yields and flower quality, compared with all other cannabis production systems. CAN! is the world's leading expert on cannabis HoopHouse production systems and offers specialized consulting on the design, construction, and operation.